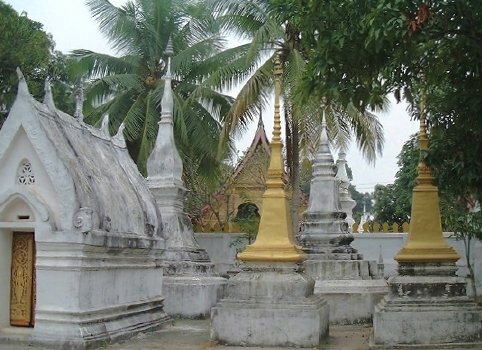 As you probably know, a wat is a Buddhist temple-monastery and, unsurprisingly, they come in all shapes (well, sort of) and sizes. 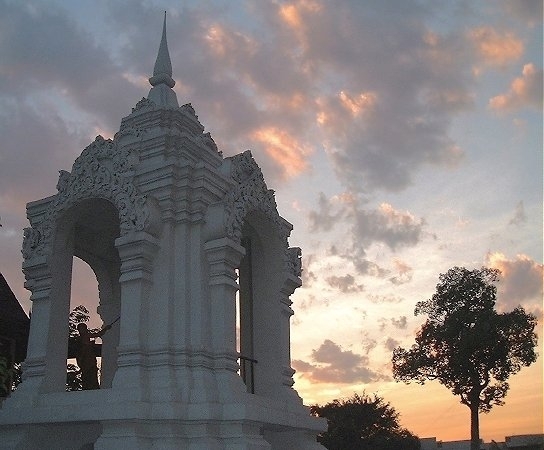 This page features photos of wats in Thailand, Laos and Cambodia—although for Cambodia it's of the ancient variety, at Angkor, which you may or may not have seen yet at this site. 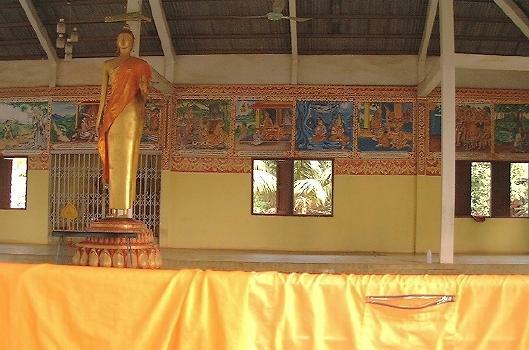 Anyway, we hope these few images give you a sense of just one of the areas of great beauty in SE Asia. Pictures hardly do them justice, of course, so hopefully some of you will have the opportunity to see for yourselves when you go—that is, if you haven't already! You may recognize a photo or two here, if you've already been to some of the other pages at this site. However, many appear just here on this page. That said, though, if you'd like information on any of the things (or people) you see at this site, we'd be delighted to hear from you, and try to answer any question(s), at noregrets@happytravails.com. Ok, let's start off in Laos, where we spent most of our time, and where there there's an incredible number of wats to be seen. Every town of any size will have at least one, and of course the bigger towns and cities will have more. 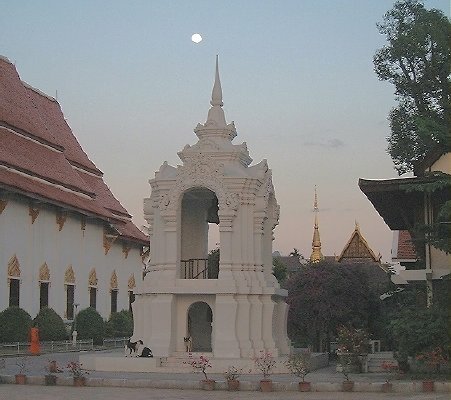 Vientiane, the capital of Laos, has seemingly countless wats, as does Luang Prabang in the north. 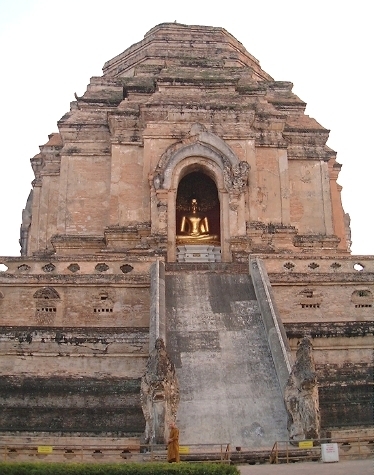 Moving northward, to Vientiane . . . 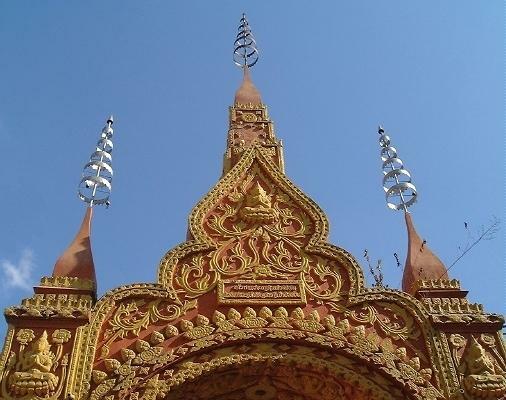 Here's the top of a gate, entering the grounds of one of the many wats we saw in the several days we were in Vientiane. 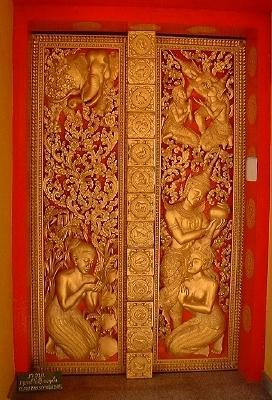 This intricate gem of a door is also from a wat in Vientiane, and hopefully gives an idea of just how gorgeous these temples can be, particularly when viewed up close. Or how about a simple metal grille? Well, okay, this one's not-so-simple! 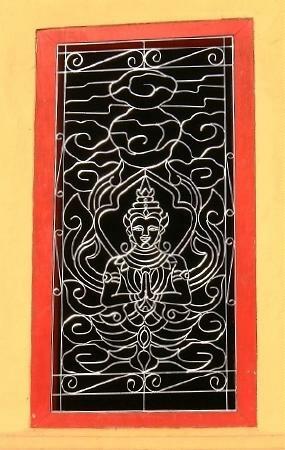 It's covering a window at Wat Ong Teu, again in Vientiane. What could have just been a simple grid is instead a rather nice piece of functionality. 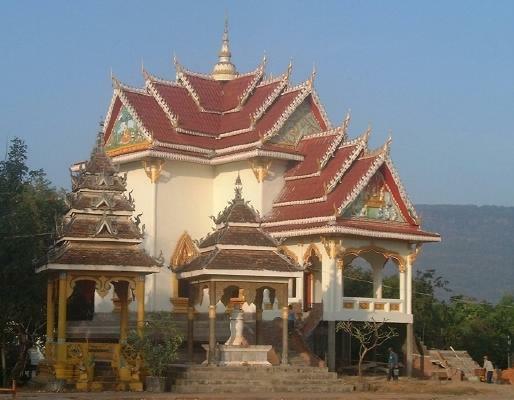 One more from Laos . . .
And now on to Thailand . . .
And, yes, that's a full moon up there, not a UFO! Built way back in 1411, Wat Chedi Luang, according to our Lonely Planet guidebook, "contains the ruins of a huge chedi [stupa; monument erected to house a Buddha relic] which collapsed during an earthquake in 1545. A partial restoration has preserved its 'ruined' look while ensuring it doesn't crumble further." 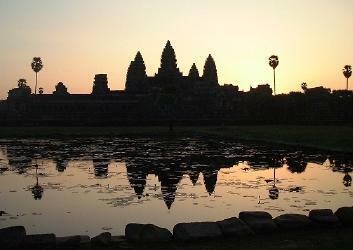 And, lastly, Cambodia . 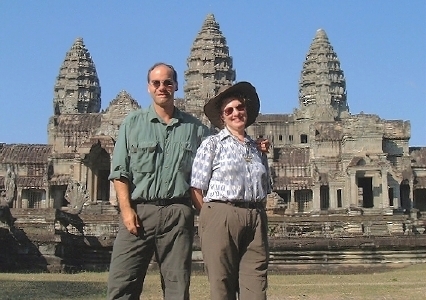 . .
Just a few shots here, which you can also see—along with a lot more—at the various Angkor web pages. 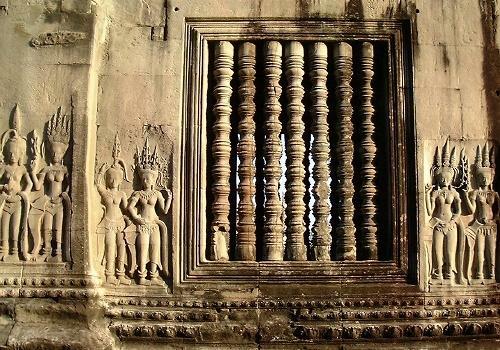 While the vast ruins at Angkor were once used for a variety of purposes, Angkor Wat, of course, was really a working wat. Remember, whatever you do, . . .
Well, that's it for this particular page! We hope you've enjoyed looking at these photos of wats, and also hope you'll get to look at some of the other pages at this site, whether it's for more wats, or people, or whatever. Thanks again for spending a little virtual time with us!